A bit of historical context always helps. So I’ll start with mine to explain that bucket of water. Long ago, I left my religion Christianity, disenchanted by its dogma. I specifically hated it when the Bible preaches that if you don’t place your entire faith in Jesus, then you’re bound to hell no matter how righteous you have been. I thought: what? ?If your life has been spent doing good things for the world, then ultimately it comes to nothing if you don’t believe in Jesus Christ? What kind of ‘merciful’ and ‘loving’ God is he? Only a tyrant demands that you submit before him. I don’t want to bow before such a tyrant even if he holds the keys to heaven. I began to explore other religions. I explored Hinduism and like the idea of divinity in all things of the universe. However the caste system is a big turn off. I explore Islam and was instantly repelled. I found that it was worser in its dogma than Christianity and very misogynistic. There are verses which calls for imposing Islam to the entire world and killing those who leave Islam. However, after leaving religions, I found that there was certain emptiness in my heart. Something that religion gave me was missing. I found the answer: Spirituality. It is often a term which was used interchangably with religion, but now I understood its true meaning: the feeling of connectedness with the universe. I haven’t found any logic to explain it, because it isn’t the logical part of your mind that deals with it. You just need to allow your heart to guide you in your spirituality – it will come along. Religion in the end, I found, was just a collection of spiritual experiences by ancient prophets – but like any other man made stuff, there are flaws. Like “follow me or go to hell” dogma of the three semitic religions or the caste system of Hinduism. Spirituality meanwhile is a ocean – there is the limitless universe and you can only connect yourself to so much. Religion is like a man who took a bucket of water from that huge ocean. What about the sun? Well, its the current object that I’m connected to. The huge factory of nuclear fusion reaction that gives out heat and light that had been powering all the life in our planet Earth. Without it, we wouldn’t have existed at all. And I’ve dedicated myself to using renewable energy to counter global warming caused by fossil fuels. Hence I call myself the Solarii Knight or the warrior of the Sun. I often encounter theists who argue over which God is true and supreme. Each have an almost convicing set of arguments which includes quoting from their scriptures and along with reasoning to convince someone about their faith. Lets look at how God is viewed. Christians, Jews and Muslims view God as a super natural force who created every the universe and the living things in them. The Hindus view God as one true God worshiped in different religions under different names. Needless to say we can see the conflict amongst diffeent religions. Each holding their own God as true and other Gods as false. Let me explain how I view God. Please look at the cuboid below. Imagine it being hung in a space. 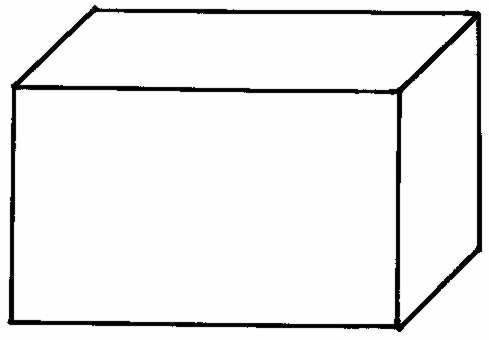 If you see it from the front side, you’ll see a rectangle. If you see it from the smaller side, you’ll see it as a square. If you see it slightly tilted, you’ll partially see two or more sides. My view of different religions is similar: each having a small understanding of God and no one has a complete understanding. However, some might argue their holy scriptures tell them to not worship other Gods. Its simple enough to think how that came: If you are a holy prophet who wrote a holy scriputre, you would only belive in what you saw and not what others saw isn’t it? That will make you write explicitly not to follow others. We all need something – or someone always caring, prefect, all knowing and a friend. The most common such source is God. God is all knowing, caring and perfect in all aspects. Men who had come across this supernatural force have always tried to understand God and they have written down or spoken their experiences with this supernatural forces. This has resulted in rise of various religions. However, here’s the catch. Can men, whose powers are limited fully understand God? They may understand better than most, but its not full. If they are fully able to understand God, then they have to be equal to God. We know that is not true. Yet many follow holy scriptures like the Bible, the Quran or the Gita and each one assumes the one scripture that they follow to be the ultimate truth. If we end up blindly following everything they say about God, we can be wrong in many ways – may be as wrong as the ancient men who thought that the earth was flat. I believe that we might be able to understand a part of God which the religious Gurus like the disciples of Jesus Christ(or even Jesus Christ, but he never wrote a book so we don’t know! ), Prophet Muhammad, etc never looked into. We will be able to understand God fully – only bits and pieces but the journey will be exciting one as we will be treading on a path unknown.